A little recap on my rock work projects. I met my goal of finishing the rock work on the hillside of my house. I even managed to get a few plants in the tubs. I'm ahead of schedule on another hillside area I want to cover in rock. I didn't expect to tackle this until next year. This is the last major rock area I am putting in my yard. I did a little walk around my garden. I still have some artichokes growing. I have harvested two so far and they were yummy. A little salt and lemon juice was all they needed for a delicious treat. I was surprised to see some broccoli heads. Most of my plants I have let go to flower. I think I will eat these for my lunch. My green cabbage was a disaster but my red cabbage did great. I have some tiny brussel sprouts. I worked outside everyday last week but before I went to visit my parents in Washington we had almost two weeks of rain. I took on some blouse sewing. I had great success with this pattern in a size 10. I like version "D" with the long sleeves but made a straight edge instead of the diagonal cut. I made a new pattern with white tissue paper. I also took out some of the flare in the hips. Here's a selfie of the top I made in a rayon batik. You do see a dog trying to photo bomb me. I can make this top in 2 hours. It just slips over my head. No buttons or zipper. I saw another quilt blogger's blouse she made from this pattern and decided to try it. I went right for a size 10 and found it much too tight. Yipes! I have broad shoulders that can be a problem area for me in clothing but this was also very tight through the bust. I really liked the pattern and went to Walmart and bought some fabric for 50 cents a yard. Made up the top in a size 14. I just made the short-sleeved version to get the fit right. I had a stash of a solid eggplant colored rayon batik that I bought from Cherrywood Fabrics twenty years ago. Really! I hope they will start making their rayon batiks again. Anyway...I found a printed batik rayon at a local quilt shop that I had to bring home. It matched the Cherrywood fabric. Sometimes that stash really comes in handy. I also added solid batik cuffs to the 3/4-length sleeves in the pattern since I prefer a full-length long sleeve for our winters. I've got another pattern to try. This will be a bit more time consuming. Buttons and collars. I am going to make the basic long sleeved blouse without pockets. I made a mock up of this pattern too and turns out I needed a size 12 for it. Again, the mock up is just a short version that covers the areas I need to fit...shoulders and bust. Another cheap piece of fabric from Walmart. It's not often my cutting table is clear so I took the time to cut out a dress I would like to smock and make for my niece's baby girl. I'm using a fabric with Alaskan forget-me-nots. I did a lot of smocking...very many years ago. I still have my pleater. On my visit to my parents I gathered a few things to bring home. One was a quilted jacket I made for my mother at least 20 years ago. It fits me rather well...funny how that worked out! My mom found it a little on the hot side. I think it will be perfect for running around on my errands when the weather temps start dropping. This was another project made from Cherrywook fabrics only this time with cotton. I have a lot of the cottons in other colorways in my stash too...maybe another jacket is in my future. I was a garment seamstress before I started quilting. I even lined this lovely jacket. Button holes are very easy to make on my Bernina. Also did the fabric covered buttons to match. I still have the pattern. I also found six other jacket patterns that are 20 years old...I made one of them and it was a flop. I bought all of these patterns at the Houston quilt show. I used to live in San Antonio so I made it to the quilt show every year. None of the styles interest me anymore. Probably time for them to leave my stash. The pretty day is calling to me to get off the computer. I was so pleased to get an invitation to join the fun of a blog party. I look forward to meeting some new folks in the blog world and introducing myself to you! I have been living in Eagle River, Alaska for 20 years with an unexpected 3-year stint in Paris due to a great opportunity for my husband with his job. It was a great experience to live in Europe but I missed Alaska. Glacier Tour for my birthday with my son, Zack, as my pilot and tour guide. I can look right outside my door and see all kinds of unique scenes from wildlife. This is a grizzly that we have seen several summers. She was dubbed Fabio on our neighborhood Facebook page until she showed up with this cub last summer. Not a "he" as most assumed, but a "she" that is now called Fabia. We also see moose pretty regularly. Both of these wildlife photos were taken on the road in front of my house. You might be surprised to know that moose are more deadly than bears in Alaska. But these are my favorite critters, our Gordon Setters, Logan and McKinley. But you came here to see quilts! My preferred quilting designs are patchwork with batiks. I have a 17" Nolting Fun Quilter that I use for machine quilting. Here's a little look at a quilt I designed on the software EQ, titled, "Paris Flower Shop." I made this in my little Paris sewing room. My intention was to design a quilt involving 2 1/2-inch strips. I'm rather known in my quilting sphere for being a bit obsessed with taking the scrap Half Square Triangles from quilt projects with 2 1/2-inch strips and making a new quilt. The finished size of the HSTs are 1 1/4-inches. One of my current favorite quilts came from a panel challenge my Material Girls quilting group organized last year. Below is a peek of it getting blocked. I had a set of Hoffman Batik Hawaiian Applique-looking 10-inch squares. I had been coveting them for years trying to decide how to put them in a quilt. The background fabric was a batik piece I had in my stash for even longer that I bought at an adorable quilt shop on Kauai. The challenge was just what I needed to marry everything together. I use my blog as a journal to keep track of my projects. And every now and then a little travel adventure. 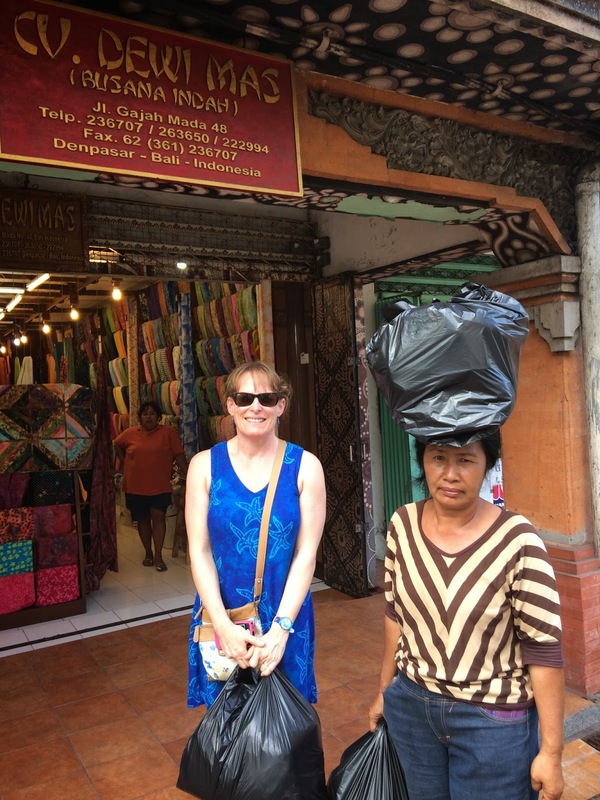 Hard to top my Bali trip in 2013. Black plastic bags full of batik fabric I bought at $2 a yard. 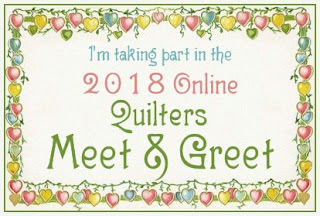 Now it's time for you to meet more bloggers in the quilt world. And don't forget to enter the fabric give away. Just click on the linked box below to visit with more fun quilters. And click again to enter for the Grand Prize.